"Uneven aging isn't always physical. I looked forward to traveling after we both retired, but my partner has become a homebody. My married friends would rather travel alone or with another couple. My single friends want to go to Vegas or on a cruise; I'd rather be hiking in nature. Finding a sympatica travel buddy isn't easy." Rebecca is dealing with two factors: what she prefers to do, and whether she'd like company on the trip. 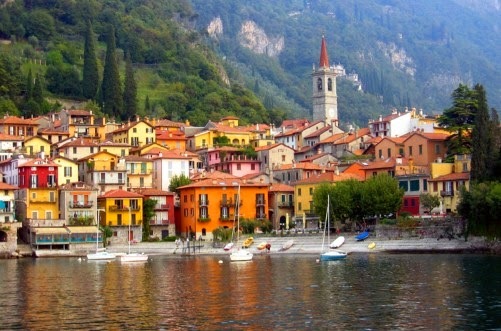 If no one wants to hike, I'd think about a woman's tour such as a hike of the Italian lake district, even if it does not include a stop by George Clooney's villa. Adventurewoman.com offer this enchanting 10-day itinerary for the coming fall. The women will likely be sympatica, since all are drawn to the locale and to hiking, but I expect you would have more affinity with some than others, which is the essence of adventure, no? And since today is St. Patrick's Day, it's only right to mention Joyce's women-only walking tour of Ireland, among the many other hiking-heaven offerings. Do you know the site Journeywoman? Whether you seek the archeological sites in Turkey or wish to camp within hailing distance of Alaskan grizzlies, Evelyn Hannon knows who and where. That site introduced me to Women Only Worldwide Tours (operated by Indus) who advertise "no single supplement", music to solitude-loving ears. Road Scholar (founded by Elderhostel) specializes in educational trips, some women-only, such as this hike in the Rockies. Road Scholar trips are designed for mature travelers, a relief if you want to be sure you're not kept awake by 20-somethings doing shooters next door at three a.m., but are hardly slo-mo cruises. For some trips, RS charge no single supplement, and for others, will assign a roommate if you don't have your own. They also offer inter-generational trips for a loving aunt or grandparent who wants to share more of the world with an eager youth. Those who would enjoy a highly-personal, learning-focused trip should check the gifted author Naomi Duguid's immersethrough food tours of Burma and Northern Thailand, which are far from the usual fly-and-fry "cooking schools", and deliver the best of culturally-resonant travel. Countless other choices are on offer; we're limited only by budget, not imagination. If you have booked tours before, you will know to add costs for medical insurance, and to check refund policies before payment. I've presented the tour option without having taken one myself, so invite you to share links to operators you think are outstanding. Tours can be costly and you may not want the regimentation; if you prefer to travel solo, you could hire a guide at your destination, from a half-day to the duration of your stay. Friends are often good sources for such guides, or try a search on TripAdvisor for "private day tour" plus your destination. Even if you're a longtime solo traveler, your age will change the way you travel. I still travel alone—just hop a train and explore a city or region—but now appreciate a hand with everything from handling luggage to finding a doctor for an emergency case of pink-eye. As she matures, the woman with wanderlust may have to find the path on her own, to fulfill those must-see goals. Do some adventuring, even if it's only a day's drive; the view from an old friend's garden can be restorative as that of the Taj Mahal. That you return to your everyday life enlivened and grateful for the richness of this world, is purpose aplenty. We may no longer throw on a backpack and crash in any funky hostel with a free bed, but we ought to get out and about while we can. I have had the same experience as Rebecca with my husband having decided that he prefers to stay home rather than to travel. For me, retirement is the opportunity of a lifetime to visit different parts of the world. I tend to rent apartments in different places and to establish a "home base". A walking tour company that I used last year "HF Holidays" is worth a consideration if you enjoy walking at a comfortable pace with people of similar age. There were 3 levels of walks and sometimes I went off by myself. The walk leaders are volunteers and HF is a cooperative that owns a few country homes in Britain. There were couples, and single men and women aged 50-something to 92. If you have an interest, there is always a holiday opportunity for a solo traveller. Rebecca's comments resonate with me. Being on my own, I've found that married friends are tied into travel-with-spouse and single friends don't have the same interests. Finding a travel partner with similar financial expectations is tricky too. As a strong introvert, I've struggled with the question of sharing with a stranger vs paying a supplement. After mulling all this over for a couple of years into retirement, I'm now planning my first solo trip to England. I've found, as I suspected, that planning the details of a trip is a lot of work but rather satisfying if you want to do your own thing. For places where I don't speak the language I would probably try a tour. Solo Traveler info@solotravelerblog.com has some good information and I'll be checking out the other suggestions. Would Madame La-bas be willing to share some details about how best to find short stay apartments? These sound like wonderful resources, Duchesse. I want to suggest Santa Fe, NM as an easy and fun destination for a solo traveler--especially for the traveler who loves art. American Airlines flies directly into Santa Fe now and the central part of the city could be enjoyed without transportation (other than your own legs.) You could book a walking tour, or set out on your own with a map. There are many museums (including the Georgia O'Keefe) as well as art galleries of all types. My favorite part of the art scene is Canyon Road which does not get many tourists compared to the area around the square. If you were willing to rent a car, there are even more delightful things to see closely. The little village of Chimayo is a favorite of mine, along with the renowned spa, Ten Thousand Waves. While I have never traveled totally alone to SF, I have spent many many days wandering the city on my own and always had a a wonderful time. What a great service you provide here, pulling these tour companies together. My girlfriend has been offering painting classes in France the last couple of years and most of the women come on their own for a week in a small village where they get organized into rented homes (yes, each their own room -- so important to many of us). This fall she's organizing a sketching week in Paris and I think it's the perfect way to have a solo adventure with support and company. I hate to think about losing my favourite travelling companion for whatever reason, but if that should happen, I hope I'd find ways to keep adventure on my itinerary -- as you say, even in smaller packages, it's so important. She had such great holidays...I am going on one myself this spring to Paris. I guess I do not have to feel so bad about this anymore. I have a loving marriage but travel has been a sore spot for many years. I am not anywhere close to retirement. I am an empty nester and was looking forward to traveling once my child left home and am hoping for future travel after retirement. But my husband is clear about that he would rather be home. I have girl friends but not all of them have the money to travel. Thanks for these resources, I will book mark them. These are great resources indeed. And for those who might be interested in an art- or writing-related study/vacation, remember the Ghost Ranch in New Mexico. I've done the writing intensive twice, once on my own and once with a friend. Classes of any kind can be a good focus for a holiday stay if travelling alone. As well as visual arts and writing, think of language classes at a destination you like. Sometimes these can also be a key to affordable accommodation. Not necessarily luxurious, but private. I've sometimes had remarkable luck in terms of residence stays in Italy, for example. Since reaching 50, I have reconnected with my college girl friends in an active way. There is a loose group of about 8 of us and we have met up in different locations every 6 months or so. Last year we walked the Cotswold Way and next month we plan to walk Hadrian's Wall. We all still have our partners and holiday with them also. But we find these all women trips invigorating and restful at the same time. Reach out to old friends and you may find a wonderful new relationship. Thanks so much! Would love to hear some recommendations from Lagatta also. This is a brilliant idea; I am going to make note of these and start doing some planning for a trip of my own! Always such a great resource - you bring us actually useful information. If any other readers go on a trip using these groups, I hope they report back! Thank you, Duchesse, for lots of wonderful ideas. I have ventured out on my own domestically, but haven't had the guts to travel internationally alone. These resources should give me the kick in the pants that I need. I learn so much from you and the other posters. In australia there is a company called sisterhood travel. A friend of mine went on one of their tours and she was with a woman who was on her 6th tour in 2 years! I love the idea of women venturing out from here, starting here, radiating out. Frugal, I was studying abroad with scholarships, when at university (as an "adult" student, but I was in my 30s). At Perugia and Rome, and found campus housing. Recently, I had been planning to do a German course in Vienna, and observed that at the University of Vienna the student housing for summer students (of all ages) was a very reasonable cost, and there were private (small) rooms. Various issues ruled out that trip for a while; for one thing a friend of ours in that city had died (and even before that, he had completely broken down and was spending his days chain-smoking and binge-drinking and watching TV in his flat all day... best avoided. But I'll get there (another, much closer friend is of Viennese origin and I've always been drawn to the ambience there - and the coffee). One thing to keep in mind for language study is that you don't want to be in the largest capitals where many people speak English. Oh, you don't have to stay in a small town if you love city life; just choose a French city other than Paris, for example. As for travel with a friend, my fondest dream is not really travelling with one of my women friends but with one of my closest friends from way back, who is a gay man! I also wish la Duchesse a happy St. Patrick's, and my cat Renzo a happy 19th birthday! The majority of our Music and Markets Tours guests are women...by far! In fact all of the bookings for our upcoming spring and summer tours are women. We love sharing beautiful places, wonderful music, fabulous cuisine and wine with others, and that prompted us to start Music and Markets Tours - and through the years our guests have become good friends. Travel can lead to wonderful friendships! I just returned from my first cruise, to three Caribbean destinations. It was Spring Break for my college-age daughters, but my husband couldn't go due to work. We went with a married couple and their daughter, long-time friends, and also my high school (single, no kids) best friend. This is the third Spring Break we've travelled with this same group (plus my husband). My single friend loves to travel and we love having her with us. She & I took a trip to New York last December, and we are contemplating a genealogy-focused trip together to Great Britain. While my husband does like to travel, and I'm really hoping that doesn't change when he retires in a few years, I'm lucky to also have my Travel Buddy. We are young enough to still organize our own trips...usually more active than just cruising...but some of the suggestions for women-focused travel groups are definitely something I'd look into a few years down the road. It's a big beautiful world out there!